As soon as the air is cool and the leaves start turning color, all I want to do is make soup, stews, breads, and anything inspired by autumn. Since Halloween and Thanksgiving are upon us, my thoughts naturally turn to pumpkin. 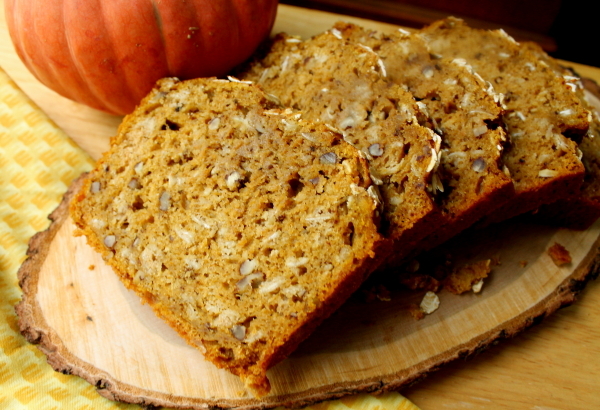 I decided on a pumpkin bread recipe made with honey instead of sugar, lots of spices, and old-fashioned rolled oats. The oatmeal is not just in the bread, but also sprinkled on top before baking. It’s not an overly sweet bread and has lots of flavor and moistness. It even gets better with age, so if you can wait, wrap it up in plastic and give it a day or two. And by the way, those beautiful fall leaves in the photo are from the Red Sunset Maple tree in our front yard. Preheat oven to 350 degrees F. Grease two 8-by-4-inch loaf pans; set aside. Place flour, 1 cup of the oatmeal, baking powder, cinnamon, baking soda, salt, ginger, mace, and cloves in a large bowl. In a small bowl stir together honey, oil, and eggs. Add to dry ingredients in large bowl and stir just until blended. Stir in the pumpkin, nuts, and orange juice and mix until just blended. Divide batter between the two prepared loaf pans. Brush the tops with beaten egg white, then sprinkle each with the reserved 1/4 cup oatmeal, dividing evenly. Bake for about 50-55 minutes, or until a wooden pick comes out clean. Cool in pans for 10 minutes, then remove bread from pans and allow to cool completely on a wire rack. Wrap cooled bread tightly in plastic wrap and let sit a day before slicing for best flavor and moistness. Slice into desired size pieces and serve. The bread is good plain, or spread with butter or cream cheese. Makes two 8-by-4-inch loaves. Wonderful! 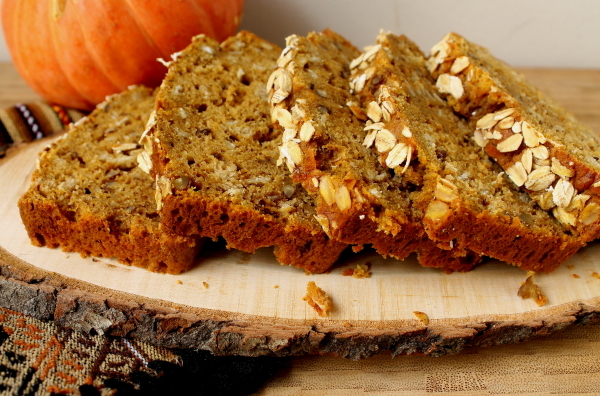 I was looking for a pumpkin quick bread recipe to take to a meeting this week and there was your email blog heading ‘Harvest Pumpkin-Oatmeal Bread’; such perfect timing! 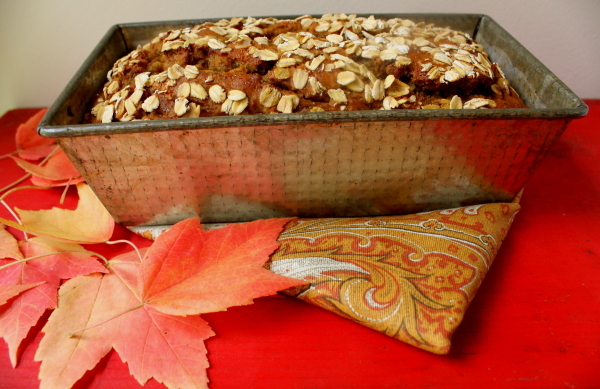 Thanks for sharing the recipe and your lovely autumn leaves. Fall is a glorious time of year for baking all sorts of yummy things.